FROM vest-pocket urban green spaces to colossal Edens like Longwood, the former du Pont property that sprawls over 1,050 acres, the Philadelphia area is laden with public gardens. Some hometown boosters claim it has the country's largest concentration of them. You might even say the city has a plethora of gardens. But plethora means "too many," and there can never be a surfeit of gardens, can there? Especially not in spring and early summer, when a garden visit can chase away the spirit-dampening effects of a long gray winter. (Longwood charges $16 per adult), and one, Chanticleer, that costs just $5 for adults. The selection, as it happened, provided a mix of history, terrain, setting and atmosphere — and a few unexpected encounters with wildlife. When I arrived at the Jenkins Arboretum and Gardens in Devon, Pa., early one mid-May morning, the air was cool, and though the sky was cloudless, the thick tree canopy allowed only a few glints of sun through. I picked up a map at the visitor center, then started down a winding, paved trail, spotting no one. But the dulcet songs from many birds above indicated that I wasn't totally alone, and that I might be in for something special. Jenkins Arboretum is tailor-made for those who like azaleas and rhododendrons. 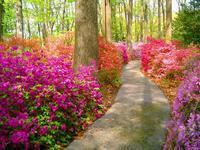 In springtime, its 46 acres are ablaze with pink, white, peach, rose, red and purple blossoms — Purple Splendor azalea and pinxterbloom azalea, to name a few. Tall white oak, mountain laurel, common persimmon, black locust, white ash and other hardwood trees (the names provided, thankfully, on tiny black plaques) act as the background. At my feet were native jack-in-the-pulpit, alumroot, ferns, wild blue phlox, dwarf crested irises and a farrago of other small flowers. So gorgeous was the picture that, as I rounded a corner, I was not surprised to find a painter at her easel, trying to capture it, and then — a little farther down the path — another one. From Jenkins, I drove a few miles southeast to Chanticleer Garden in Wayne, where the tag line is "A pleasure garden," and I could not agree more. Nor, probably, could the children who were gleefully rolling down the lawn of the central hill while I was there. The garden is next to a 1913 mansion, but it was developed beginning in 1990 and has a modern feel. There's an Asian woodland, a water garden, a serpentine planting of Garnet Red mustards and a ruin set in a garden. It pays to look hard. In a fountain at the ruin, there are faces carved into those rocks. Round rocks have become acorns, and flat stones are marked with the veins of leaves. Beyond a curve in the path near the water garden, where lilies float and deep-blue irises line the edge, you'll find two neon-green Adirondack chairs. While I admired their brilliant color, two ducks flew inches over my shoulder, startling me. What particular blooms will you find? Here's a sampling: Japanese snowbells, purpley-pink primula kisoana, bright orange poppies and pink-and-white tulips. On one path, near the 1728 house, Chinese dogwood and grape hyacinths; on another, white dogwood trees; near the waterwheel, blue clematis. Farther south in Delaware County, Swarthmore is the very definition of that old cliché, the leafy suburb, but it's a flowery one, too. On the way to the Scott Arboretum at Swarthmore College, I passed home gardens whose pink and rose azaleas acted as hors d'oeuvres, whetting the appetite — which was soon sated. The whole campus, some 330 acres, is actually the arboretum, and garden staff members can direct you to which of the more than 3,000 ornamental plants are blooming. Or you can pick up a map and turn on your cellphone. Dial (610) 717-5597, watch for cell pictograms as you walk around the campus, and you'll be guided on a tour of featured perennials, viewing blooms like Ruby Slippers lobelia and Purple Smoke baptisia. I decided simply to wander. The plants, labeled with Latin and common names, are spread throughout the campus but are grouped in "collections" of peonies, lilacs, rhododendrons and so on. Some roses, in a crescent-shaped garden, were already out in May — large-flower climbers like White Dawn and Silver Moon and a pale, soft Harison's Yellow Hybrid. Scott also has several courtyard gardens, like one at the science center that has a variety of blue and purple flowers set against rocks, bamboo and river birch trees. Be careful of the brochure boxes around the campus. More than once, the brochure came with hundreds of ants. Heading to Bartram's Garden in Philadelphia, I wondered: Could this possibly be the way to the country's oldest existing botanical garden? So near the airport, trolley tracks and oil tanks? Yes, Bartram's, which dates back to 1728, is an urban oasis. John Bartram traveled all over the eastern United States to gather and bring back trees, shrubs and herbaceous plants to these grounds, which descend gracefully to the banks of the Schuylkill. You can descend along a winding trail down to the river, too — Philadelphia high-rises are off to the left, industrial hulks to the right — passing trees like osage orange, green ash, river birch and baldcypress, intermixed with wild ginger and pachysandra. Woodlands and specimen gardens, not ornamental gardens, dominate Bartram's. The pretty flowers mainly populate the upper gardens, near the 1728 house, where you'll find wild blue geranium, light blue stars and blue flag irises. George Washington visited here, and so did Thomas Jefferson and Benjamin Franklin, for whom a white-flowering tree was named (Franklinia alatamaha, alas, blooms in late summer, so I did not see the flowers). Were it not for Bartram, the tree would be extinct. The last wild one was seen in 1803. Another history lesson awaits about 20 miles north of Philadelphia, at the Highlands, a late-18th-century Georgian residence. Most people come to see the mansion, but off to its right lies a two-acre formal garden exemplifying the Country Place Era style that flourished from around 1895 to 1940. While catering to personal wishes of the owners, the designers sought to respect the land and use historical motifs. The garden is being restored, and some parts — the vine-covered walkways on both sides, for instance — are not complete. Walk through them anyway; a grass allée meets you, stretching to the far end of the garden, where sits a classical male bust. Off to the side is a little parterre garden, four rows of four plots, anchored at the center by an armillary sphere. The plants fall into three categories — medicinal, culinary and scented — and include orange and apple mint, chives, golden lemon thyme, apothecary's rose, bronze fennel, purple cornflower, and lavender, all in various stages of bloom. The colors, the scents, the scenes — there and at the other four gardens — are just a sampling of what visitors will experience. I'm already thinking about a return trip to Philadelphia, for another group of gardens, some other time. An overview of gardens open to the public in the Phildelphia area is at www.greaterphiladelphiagardens.org. In some cases, the gardens are free, but there is an admission charge for the houses on the sites. Bartram's Garden (54th Street and Lindbergh Boulevard, Philadelphia; 215-729-5281; www.bartramsgarden.org) is open daily, except holidays, 10 a.m. to 5 p.m. Free. Chanticleer Garden (786 Church Road, Wayne, Pa.; 610-687-4163; www.chanticleergarden.org) is open Wednesday to Sunday, April to October, 10 a.m. to 5 p.m.; and Fridays till 8 p.m., May to August; $5 for people over 16. Jenkins Arboretum and Gardens (631 Berwyn Baptist Road, Devon, Pa.; 610-647-8870; www.jenkinsarboretum.org) is open daily, 8 a.m. to sunset. Free. Highlands Mansion and Gardens (7001 Sheaff Lane, Fort Washington, Pa.; 215-641-2687; www.highlandshistorical.org) is open Monday to Friday, 9 a.m. to dusk. Free. House tours are Monday to Friday, 1:30 and 3 p.m.; $5. Scott Arboretum (Swarthmore College, 500 College Avenue, Swarthmore, Pa.; 610-328-8025; www.scottarboretum.org) is open daily, dawn to dusk; office is open Monday to Friday, 8:30 a.m. to noon, and 1 to 4:30 p.m. Free.